My new favorite TV show is Animal Planet’s Must Love Cats. The show is billed as “a celebration of fascinating felines and the fascinating people who love them,” which is spot on. It’s hosted by musician John Fulton, who travels across America to find pawesome kitties, cat-obsessed people and interesting stories about “all things cat.” I was pleasantly surprised to see stories about many things I’ve already written about on this blog, such as Matilda the Algonquin Hotel Cat, potty training your kitty, and the Cat House on the Kings sanctuary. Haha – I had my finger on the pulse of cat culture, and I didn’t even know it! The show also covers many things I didn’t even know existed, such as cat poo coffee (ewwww! ), a kitty with four ears, feline fashion shows, posh cat-only hotels, and whimsical cat statues in Catskill, New York. Last week’s episode of Must Love Cats featured “catios,” something I knew a little about but had never seen on such a grand scale. 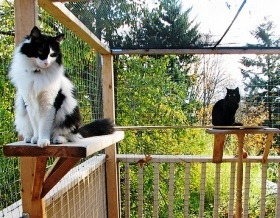 A catio (cat + patio) is a securely enclosed balcony, deck or other outdoor area that gives kitties the opportunity to be outdoors in the fresh air. They can range from small practical structures, to full-on fantasy playgrounds for cats with multiple ledges, ladders, ramps, tunnels, catwalks (ahem) and natural scratching posts. A small catio is pretty much just a cage, which I don’t think any cat would like even if it is outdoors. The giganti-cat model featured on Must Love Cats, however, is definitely something indoor kitties would appreciate. A catio is said to be “a great solution to your indoor cat’s desire to be outdoors.” Oh sure, even a 5-star catio in the backyard doesn’t give your kitty the same level of excitement they can get from roaming the neighborhood. It is, however, a safe way to allow your cat some outdoor time along with exercise and mental stimulation. It’s a personal decision whether to allow your cat outdoors some of the time, all of the time, or not all. As responsible pet owners, we have to weigh the risks of indoor versus outdoor, and consider the consequences of whichever option we choose. During the warmer months, my cats get to go outside some in the daytime, but only because they don’t go off my property. They’re not allowed out after dark, because I know they would wander, and I’m not comfortable with that risk. I have a huge yard with plenty of space for a big catio, but I’m just not sure my cats would like it enough to justify the time and expense of building it. However, if you choose to keep your cat indoors 24/7, I think a catio would be a wonderful gift to your feline friend. There are pre-built catios available, but most are either very small (little more than a cage, really) or very expensive. What I learned from watching Must Love Cats, however, is that you can easily build your own catio in a matter of hours! For the cost of some basic tools and materials from the hardware store, you (or your favorite handyperson if you aren’t the DIY type) can construct a beautiful, safe place for your kitty to play outdoors. There’s even a Catio Design Guide you can download that comes with 10 detailed 3-D blueprints, a tools and materials list and step-by-step instructions. What do you think – would your kitty like a catio? And do you watch Animal Planet’s quirky show, Must Love Cats? Does anyone know the link to that episode frome “Must Love Cats”?I really want to see it! Great post on the new show! I’m so excited that they took the time to share the news about catios! catiodesign@gmail.com. I created all of the designs and size variations to hopefully give as many kitties as possible access to a safe outdoor place to play! Excited to hear from anyone wanting to know more about catios! MOL … we were going to recommend the Katnip Lounge, too. Their catio is the bomb!!! We’re going to have to check out “Must Love Cats.” It sounds great. Thank you, Julia, for stopping by and commenting when our Maggie passed away. Thank you for your friendship, and for your offer of pet loss therapy. We are doing okay … still sad, but able to smile a little more as the days pass by. That’s the second recommendation for that show that I’ve received in one week… and I hadn’t even heard of it before that! I’m going to have to check it out. I was going to mention the Katnip Lounge too! They have a fabulous catio! Darn it all, we can’t watch that show since we don’t have cable TV or a dish. Have you seen the blog the Katnip Lounge. They have a fantastic catio. And it is a very funny blog. They have 13 cats. Would LOVE a catio but am afraid it is out of the question. We live on the second floor of a condo/apt bldg with a small balcony. However I did see the catio that someone had I believe in NY on a balcony. Maybe one day if I have extra money but with the condo association rules pertaining to the outside of our bldg I doubt we could put one in. Kritter Kondo is a great alternative for those who can’t have a “permanent” catio.